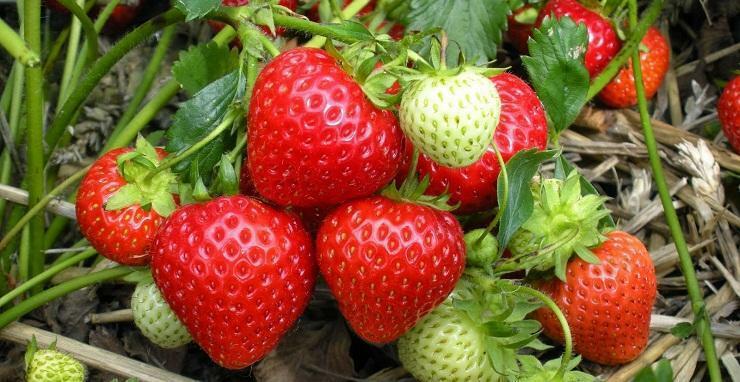 The strawberry (Fragaria x ananassa) is one of the first fruit species that offers fresh fruit during the second half of May, kicking off the fresh fruit season along with the cherries. Many people eat the strawberries fresh, as these fruits have a pleasant taste and a specific aroma. The strawberries can also be used for cakes, syrup or jams. The strawberry is a precocious species, as it bears fruit the following year, after planting, and it is easy to plant. The main problems are the high fruits’ perishability and the large harvesting costs. The strawberries have a high dietary value, as they’re recommended for liver diseases, high blood pressure, anemia, asthenia, recoveries and detox plans. The strawberries have sodium, potassium, protein, magnesium, iron, calcium and vitamins ( A, D, C, B6, B-12). 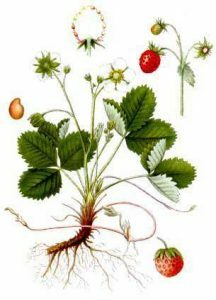 The strawberry has a short, underground stem, which has a leaf rosette on its superior side and a superficial root system on its inferior side. The root system can grow up to 40-50-cm long. 4-5 years after planting, the roots will start to become dry, causing an imbalance in the plant’s life cycle. This is why a strawberry crop is only viable for 4 years. The strawberry’s leaves live for 60-70 days, continually rejuvenating. The vegetative buds from the base of the strawberry will form the stolons. The stolons love the sun, they grow and stretch out to be exposed to as much sunlight as possible. Every shrub grows around 40-50 flowers. The flowers are hermaphrodites and they stay open for 4-5 days. The strawberry’s fruits are actually the little seeds you can see on the red pulp, which is wrongly called the fruit. Actually, the red pulp we eat is not considered a fruit, from a botanical point of view. This pulp comes from the thickening of the floral receptacle, it is not the result of the fecundation process. The strawberry starts its life cycle at a minimum of 5 degrees Celsius. During winter, a part of the plant freezes at -18 degrees Celsius temperatures. The fruits mature at 14 to 18 degrees Celsius. The late spring frostbites and compromise the harvest. The strawberry has a high-water intake. 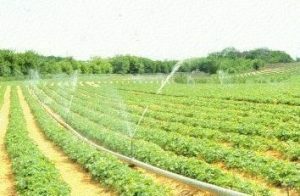 The best results can be obtained if the strawberry is planted in areas where the registered rain is 600-900 mm per year. If this amount is not reached, then the crop must be irrigated. This shrub has moderate light requirements, it can also withstand shadowed areas. This is why the strawberry can be successfully planted in orchards. The soil this shrub prefers must be loose and well drained. It doesn’t like heavy, clay and compact soils. If the crop is irrigated, the strawberry shrub grows well on sandy soils, having early productions. Good predecessor crops are the cereals and the legumes which leave the soil weed-free and filled with organic matter. Examples: wheat, corn, tomatoes, peppers, eggplants, etc. The soil must be well prepared, levelled and with no vegetal remains from the previous crop. Base fertilizers must be applied before the soil is earthed up. We recommend applying 40 tons of well decomposed organic compost or 400-500 kg of complex NPK fertilizer. 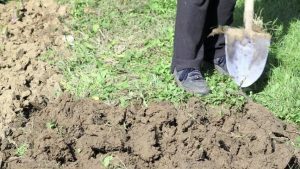 The soil needs to be ploughed at a 30-cm depth and it also needs to be levelled properly. To do this, you can use whichever tool you have at hand (the hoe, the cultivator, etc.). A soil disinfectant must be applied as there are many soil diseases. For this step, you can use: Basamid, which needs to be applied 10-30 days before planting. If weeds will grow on the soil before the planting phase, the following herbicides can be applied: Roundup Classic, Roundup Energy. All the processes related to the soil preparation phase must be completed until the beginning of September. The crop can be started with the help of the freshly harvested and healthy stolons. The recommended planting period is between the 10th of September till the 15th of October. To help the stolons grow roots, a number of procedures need to be carried out. The foliage needs to be reduced to 1-2 young and healthy leaves. The roots system needs to be cleaned. This needs to be done to take out the wounded roots and to make them 15-20-cm long. To keep a constant humidity around the roots, these need to have a mixture of yellow soil, fresh cattle compost and water applied. The following step in the planting process is digging the holes. The recommended dimension is 15 x 15 x 15 cm. The recommended planting scheme is: a 60-cm distance between the rows and a 20-cm distance between the stolons on each row. The planting material must be placed inside the holes in such a manner that the roots are straight and oriented towards the soil. The planting depth must be precisely calculated. The soil mustn’t cover the growing tip which is located at the base of the leaf rosette. The plant needs to be placed inside the soil and the soil must be well pressed around the plant. When planting, the roots must be in contact with the soil. After planting, the future crop needs to be watered abundantly. The shrubs’ phyto-sanitary condition is very important. The strawberry is affected by a series of diseases, such as the verticulum wilt, or the powdery mildew, which can destroy the entire crop. 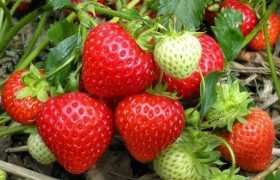 For more information about the diseases which affect the strawberry crop, as well as the proper prevention means, please click here. The strawberry has the capacity of producing many stolons. These harm the mother plant, as it consumes the nutrients needed for the growth and fruition. This is why the stolons must be taken out. These can be removed from the plant by cutting them off or by ripping them off. It is recommended that this step is repeated occasionally. 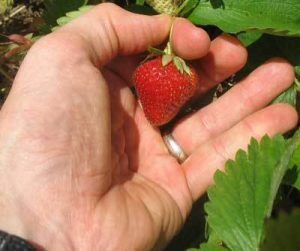 Due to its specific habitat, the strawberry shrub doesn’t grow higher than 15-20-cm long. This is why the shrub is sensitive to the weeds. 4-5 ploughs need to be carried out during the vegetation period. Right before blooming, the crop needs to be ploughed 3 times, at the same time distances. The following plough needs to be done before the fruits form, and the last one needs to be done after harvesting. If the parcel has been severely infested with weeds, the following herbicides can be applied: Sultan, Leopard, Pantera sau Fusilade Forte. 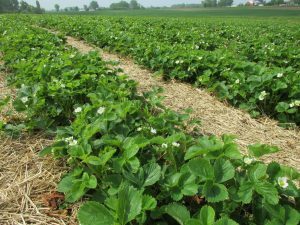 It is mandatory for the strawberry crop that the soil is mulched. The best results can be achieved is the soil is covered by a polyethylene foil or by hay. Mulching the soil reduces the number of maintenance procedures that need to be carried out, keeps a constant temperature around the roots, and if prevents the loss of the groundwater. Besides this, for the strawberry, the mulching layer also keeps its fruits clean, for a good commercial aspect. To reach its production peak, the strawberry needs extra fertilizing. Around 200-300 kg of complex NPK fertilizer is enough for the plant to have an optimum fruition. The fertilizer dosage needs to be split into 2-3 parts. During autumn (right after mowing) apply around 30% of the recommended dosage, the remaining 70% needs to be applied during spring, also split into 2 equal parts. Phase fertilizing can also be used, applying organic-mineral fertilizers, around 20-30 grams per plant. If you want to avoid having a lack o micro-elements, apply leaf fertilizers, such as: Terra-Sorb, Atonik, Cropmax or Amalgerol. Due to its poorly developed root system, the strawberry cannot survive the drought. Even short drought periods have a large impact on the production. The needed water intake must be given during the following phenophases: inflorescences forming phase, fruit forming and growth phase, fruit maturing phase, and after harvesting. If the needed water intake cannot by supplies by the rain during these periods, irrigation systems must be installed. Normally, around 4-5 watering phases, using 400 cubic meters of water per watering, are enough for the plants to grow normally. Pay attention as the excess water from the soil will lead to root rot, it will chose the root system and it will favor leaf diseases. The strawberry crop is a multi-annual crop (it produces fruits 4-5 years). This is why the shrub’s aerial parts must be rejuvenated. Right after harvesting, the mulching layer needs to be taken away and the leaves need to be mowed. This step must be carried out with extra care, not to rip off the central sprout. The eliminated leaves must be taken away and burned. This will reduce the risk of diseases and pests. After mowing, apply 30% of the recommended fertilizer dosage and irrigate the soil using 300 cubic meters of water per hectare. Depending on the species, the correct harvesting period can vary from May until July. The strawberries need to be harvested when the entire fruit is red. The harvesting process needs to be carried out during the morning or evening, avoiding the hours with an intense sunlight. This can be done in more steps, going through the field 3 to 8 times. The strawberries can be detached from the plant by ripping off the peduncle. If stored properly, the strawberries can be kept for a few days, but only inside atmosphere controlled warehouses, where you can store them for a maximum of 8 weeks. – Inside the solariums the diseases and pests can thrive. This is why the crop needs to be periodically checked and phyto-sanitary treatments need to be applied to prevent them.